It’s all about coffee this September at Tim Hortons® as the Canadian coffee chain brand spotlights everyone’s favorite morning brew. “We have always been known for our fresh sandwiches and baked goods and of course, our great coffee,” said Stephanie Guerrero marketing director of Tim Hortons® Philippines. “For this month, we want to highlight the expertise that come with every cup of coffee Tim Hortons® serves. Our coffee lineup will be the perfect companion to give you a boost throughout the day,” Guerrero added. There is a whole ‘latte flavors’ to choose from to liven up your day with latte made from premium espresso or in its signature flavors of Vanilla, Chocolate, Caramel and Hazelnut. Go classic with the smooth medium and balanced blend of Tim Hortons® Original Blend Coffee made from expertly roasted 100% Arabica beans. Better yet, get two creams and two sugars to make it a Double Double or chill with a classic with our refreshing Iced Coffee. Tim Hortons® goes through great lengths to deliver high-quality coffee-based drinks to its customers. Its bean-to-cup process begins with coffee beans sourced from the best coffee growing regions, which are then roasted and blended to perfection using a recipe known only to four people in the world. A global team of experts also taste-test 500 cups per day to ensure Tim Hortons® coffee’s taste and quality is consistent worldwide. With the work and care that goes into every cup of your favorite Tim Hortons® coffee drink, you know that you get the best quality with every sip. 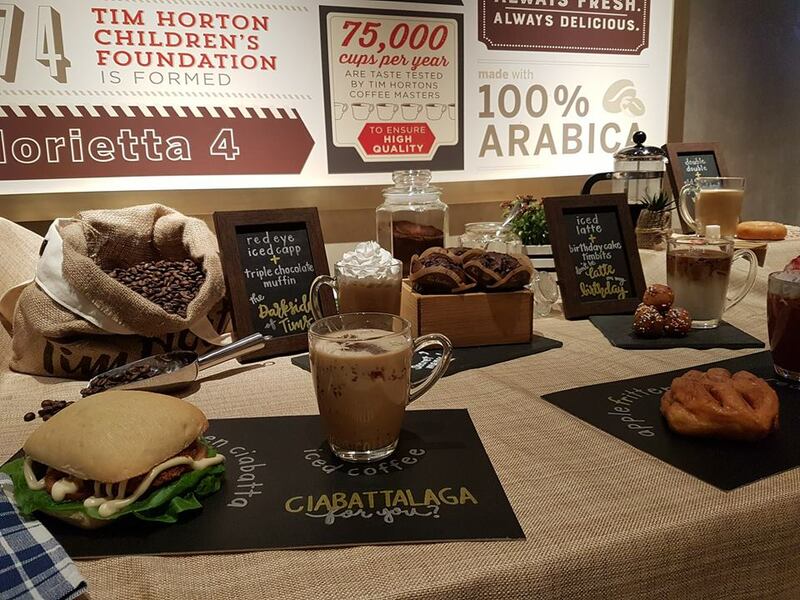 It’s no wonder Canada’s Favorite Coffee is fast becoming a staple for coffee-lovers in the Philippines. Whether to perk you up or to keep you going, or to pair with your favorite sandwich or donut, Tim Hortons® coffee roster is coffee made your favorite way. Hot or iced, original or flavored at Tim Hortons® you’ll always find a brew expertly made just for you.